A recent survey by the Australian Small Business and Family Enterprise Ombudsman found 22% of small businesses have had a dispute in the last five years, which for Victoria extrapolates to 132,000 small businesses. “There are a lot of small business owners who are currently not using our services and we are hoping video conferencing facilities will allow more small business to attend a mediation session without having to leave their home or office,” said Ms O’Connell. “Video conferencing will not replace face-to-face mediation however it will offer an alternative to small business owners where the time and cost of travelling to the mediation is too high. Using this technology will enhance our dispute resolution services”. 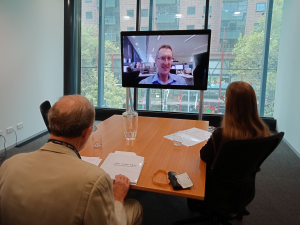 Mediator Jonathan Kaplan said “the mediation technology worked well, and it is more effective than a telephone conference, as it is important for all the parties to be able to see one another”.